Somewhere along the way I planned to respond to the prompt below, thought about it, then promptly abandoned it in my draft folder for months and months, only to rediscover it today. At first glance the safe sitting amid the ruins reminds me of the TARDIS from the BBC’s Doctor Who. In fact, I didn’t even realize it was a safe until I reread the prompt’s caption. Doctor Who’s TARDIS never changes from a Police Box into other shapes because because of a malfunction in the 1963 pilot episode, An Unearthly Child. Since then, for whatever reason, The Doctor just hasn’t been focused on getting it fixed–it being the Camouflage Unit, the Chameleon Circuit, or the Cloaking Device (depending upon the show’s episode or writer). And not that the Doctor didn’t try to fix it, because eventually the malfunction does get solved, (sort of, but by then The Doctor is fond of the TARDIS’ Police Box appearance) yet no efforts are televised repairing it between the 1963 and 1981 seasons. That seems like a long time for a crucial security feature to be offline. Mind you, it was the 60s & 70s, and security was generally lax prior to the 911 terror attacks. Besides, keeping track of a different shaped TARDIS during each new adventure might prove annoying (and even challenging) for a time traveling fellow and his companions (especially considering just how old the Doctor was rumored to be). I equate it to keeping track of where I last parked my car at the mall, but with the added complexity of it changing color and model upon each new visit. The yellow highlighted doors on the left don’t match the shape of doors seen on a Police Box. Nigel: Hey, what the hell is this?! Nigel: The doors. You’ve made them all wrong! Garth: What you mean? I built the spaceship’s interior just like the script says. Nigel: Yes, but the doors aren’t rectangles! You’ve got these angled cuts on the hinged sides. Garth: Why? What do your doors look like on the outside? Nigel: They’re tall rectangles, just like a Police Box. Garth: That’s stupid. What kind of spaceship has doors that look like a Police Box? Garth: I thought it was a space ship? Are you sure we’re working on the same set? Nigel: Yes! The Police Box “is” the spaceship. Garth: You’re telling me, the spaceship is a Police Box? 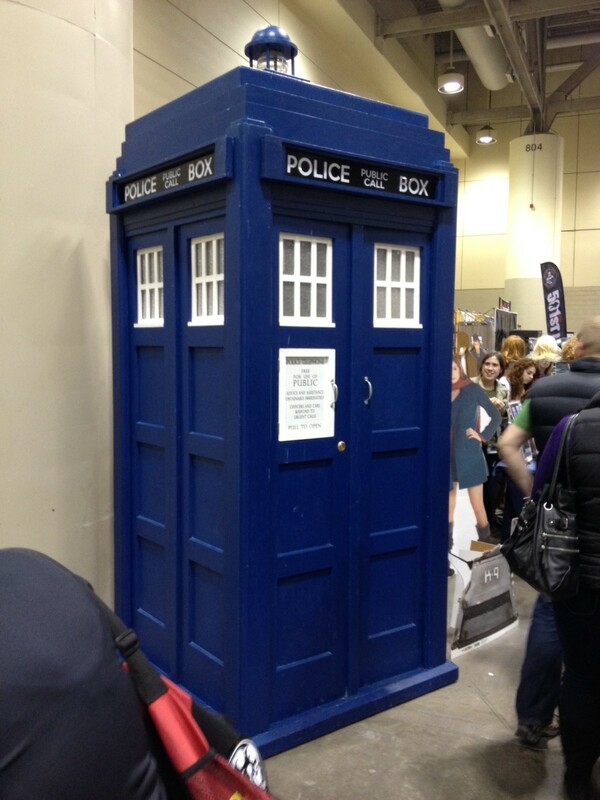 Garth: Well, how is all this supposed to fit inside a Police Box? Nigel: The spaceship is bigger on the inside than on the outside? Garth: You mean to tell me, the TV viewer is supposed to believe this room fits into a space the size of a Police Box? TV viewers are daft, but this is just plain unbelievable. Nigel: Don’t worry. The Doctor explains it to the viewers in the story. Garth: Exactly. I have no clue who the doctor is. Nigel: No, The Doctor is the main character in the show. Garth: What does a doctor have to do with space travel? Is one of the astronauts sick? Nigel: No, the Doctor is the space traveler. Garth: Really? Is that because only doctors can actually afford space travel? Nigel: No, and he’s not a doctor of medicine. He’s a scientist from another world. Garth: And he builds spaceships that look like Police Boxes? Nigel: No, Doctor Who flies the spaceship. Garth: I have no idea which doctor flies this ridiculous spacecraft. Nigel: No, no. The Doctor’s name is Who. Garth: How do you spell it? Garth: That’s an odd name for a doctor, even for a Police Box spaceship-building scientist doctor. Nigel: Yes, but your interior doors still don’t match my Police Box doors. These have got to be fixed. Garth: Listen, long before any TV viewers ever notice the inconsistency between the inner and outer doors, they’ll have to reconcile that they’re watching a crazy TV show where a scientist doctor, named Who, that flies around space inside a Police Box, which itself defies the laws of physics and spatial relations. Our doors are the least of the problem here. Nigel: Well… alright, but I still don’t like it. Garth: Relax. This show won’t even last a season, if that. If a TARDIS with a functioning Chameleon Circuit arrived in our westernized culture today, what shape or object would it mimic? It’s been a while. Too long in fact. My working title for this entry was Forsaken, but it sounded far too serious and left me with visions of Clint Eastwood’s movie, Unforgiven. While surfing tunes on YouTube, something lighthearted, corny, yet cool (or as cool as the 80s could be) inspired me otherwise. In October of 1984, Out of Touch started its climb to become Billboard’s Hot 100 number one song. MTV and Much Music were still in their infancy, and unlike today, in those days the stations actually played music videos. This video amplifies the prevalent corniness of the mid 80s. I love the video’s cigar chomping music executive, the shamelessly (and repeated) advertising plugs for Big Bam Boom (the Duo’s newest album), and Daryl Hall’s animal-print suit and slacks. Didn’t Amy Grant wear the same leopardskin jacket only one year later on the cover of Unguarded? One could say, my blog and I have been “out of touch…not around.” After nearly a year of neglect… I’m putting thoughts to fingers, and fingers to keys again. So what’s changed since last July? More than I like to admit. While away, my dearly departed mother-in-law had a song written and performed as a tribute to her. The Trifecta Writing Challenge site, where I labored and toiled over my few feable submissions, closed for good. There’s no doubt in my mind that I was in way over my head with that crowd of writers, but it was fun to try. And then one of the nicest folks I’ve read on WordPress, Rarasaur (the same that pointed me to Trifecta’s Writing Challenge), she ended up going to prison in California. Yikes! How did that happen? All of this to say, a whole lot can surely happen in a year. Looking back over the last 365 days, many personal disappointments lay scattered in my mind. I’m looking to make the next 365 days different.